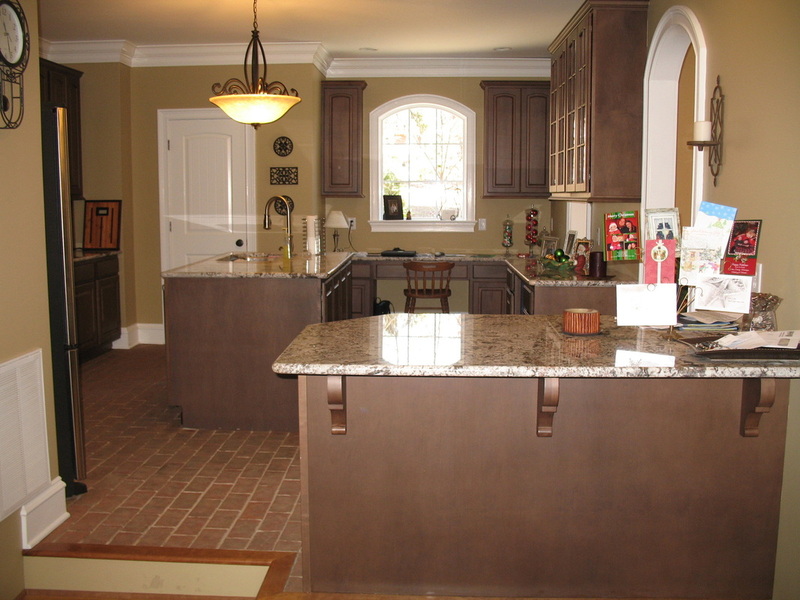 The group of pictures below is the kitchen of the Walters family, created by Kevin Ritter at Timeless Kitchens. Thank you to Kevin for the beautiful pictures, and for showcasing our brick tiles so magnificently! Click images to see a larger view. 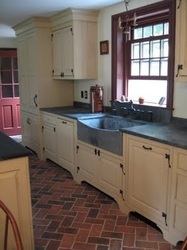 This kitchen is in Rhode Island, at the home of Susan Blume. 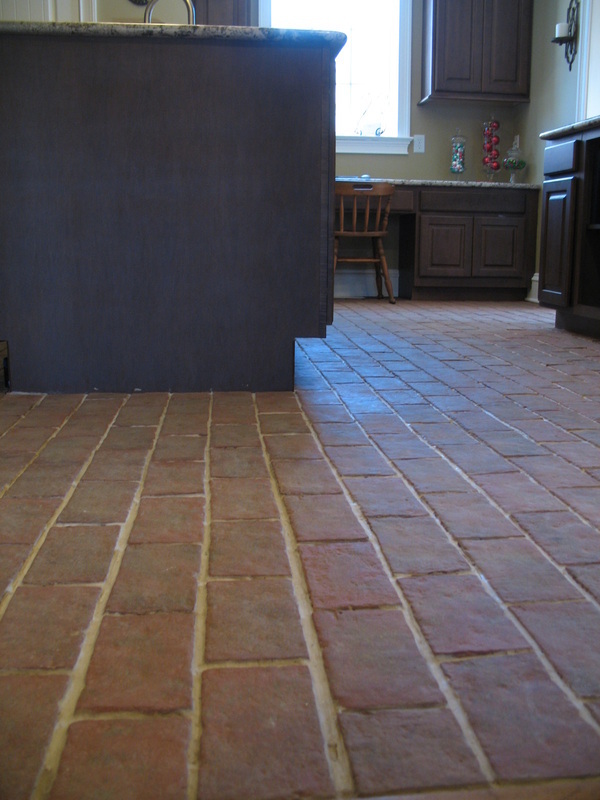 She remembered a brick kitchen floor that she grew up with, and wanted to bring those happy memories into her new kitchen renovation. Susan chose the King Street style, and butted them closely together. The grout line is very narrow. She then sealed and waxed them. 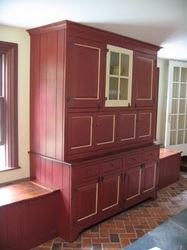 Susan wanted a satiny finish that she was able to get from the wax. 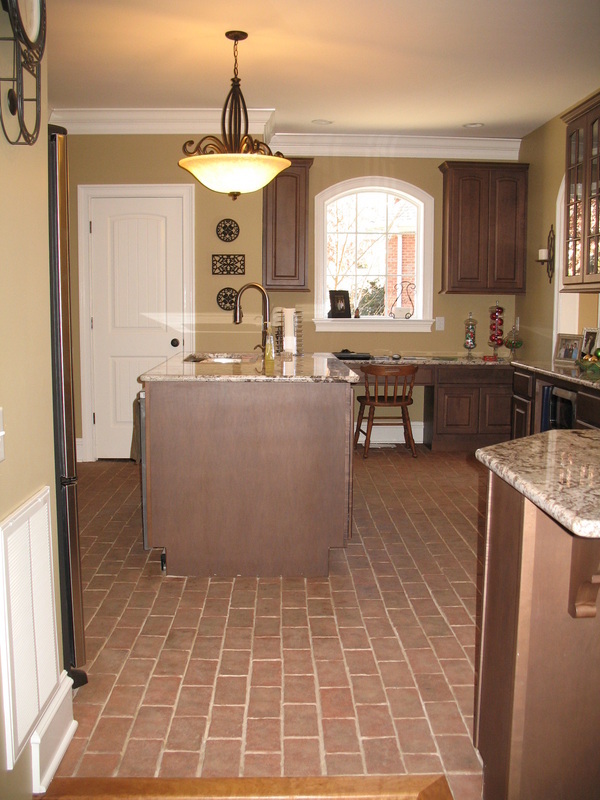 Brick pavers flooring for kitchens warms a contemporary space, and makes it feel homey. This is the kitchen of Patrick Mohan, and architect here in Pennsylvania. 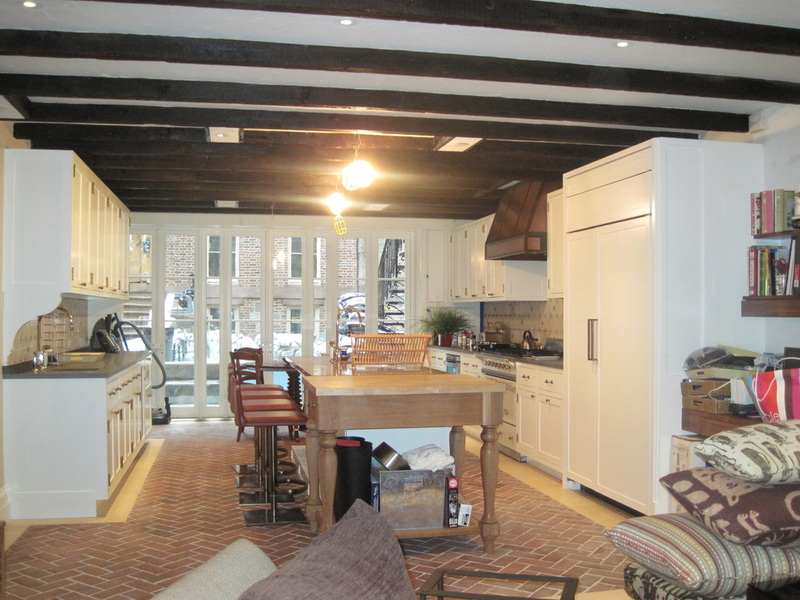 This illustrates well the blend of traditional brick with a contemporary space. 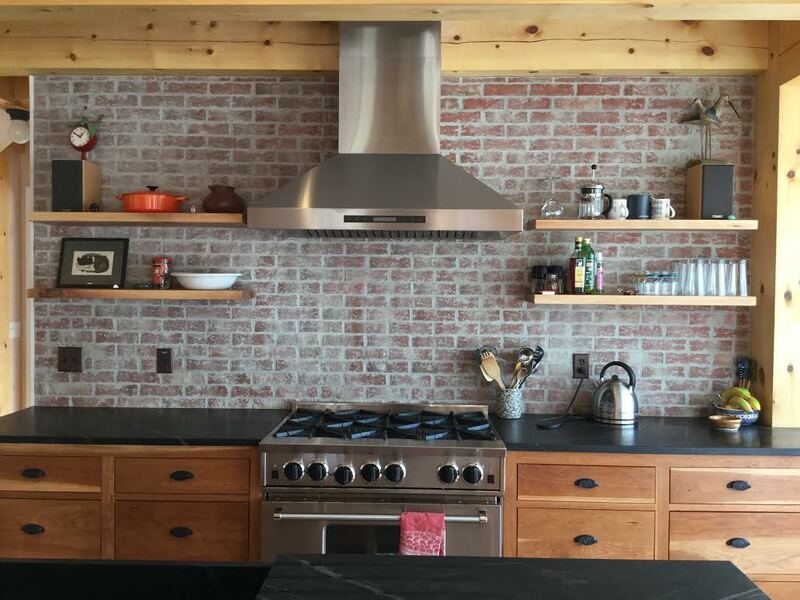 This urban loft kitchen used our Rutherford thin brick style. (Thank you to Moulin Associates for the picture!) I love the way the designers fitted the herringbone brick floor pattern into a frame, and how the bricks complement the old brick building outside the windows. 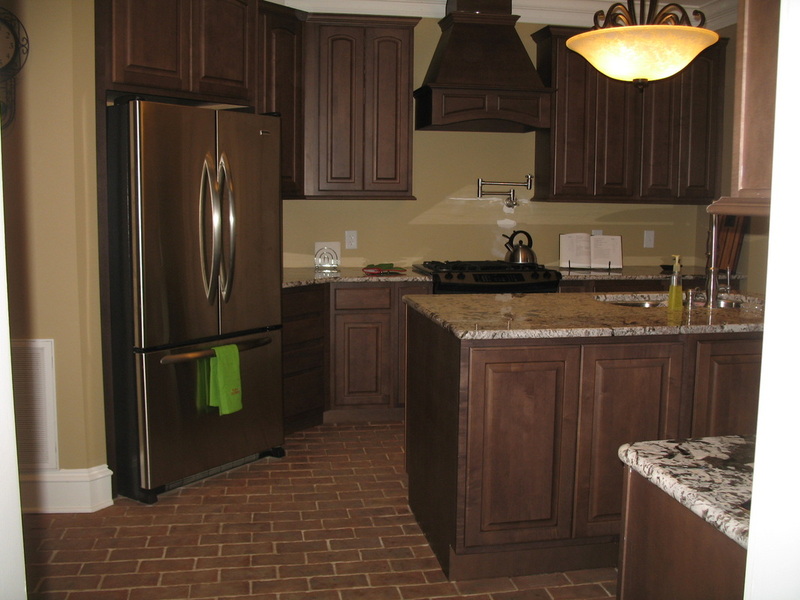 This picture also illustrates well how the crisp, modern cabinets and chrome stools are perfectly at home with a traditional brick kitchen floor. 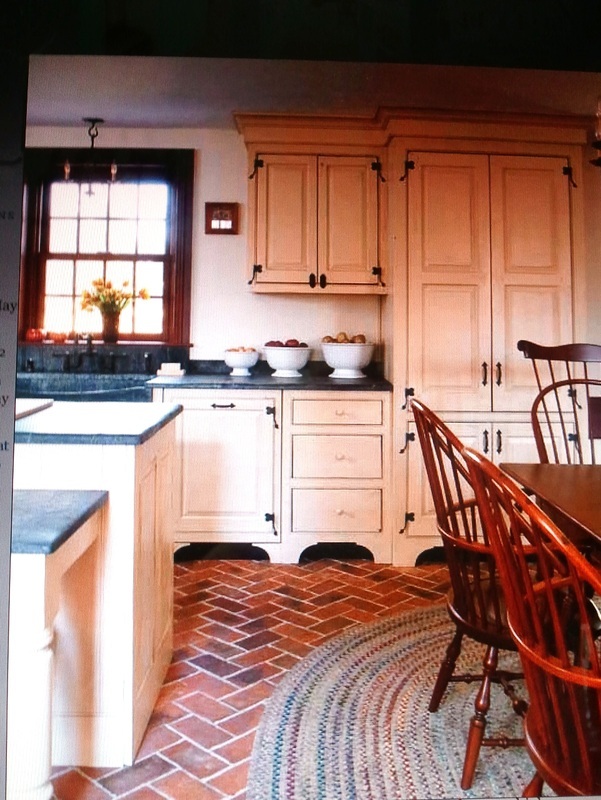 The McGuires chose our Lancaster Running Bond tiles for this stunning kitchen, laid in the running bond pattern. The color mix is a custom mix of 1/3 each Wood Ash, Off-white clay with Wood Ash, and Charred Black with Wood Ash. The arches are the Lancaster Running Bond corner returns in the same color mix. This Lancaster Running Bond back splash in the Gilles' kitchen has some of the grout left on the surface of the tiles, adding more of that whitewashed look. The Cahills visited our home office with their two beautiful children. 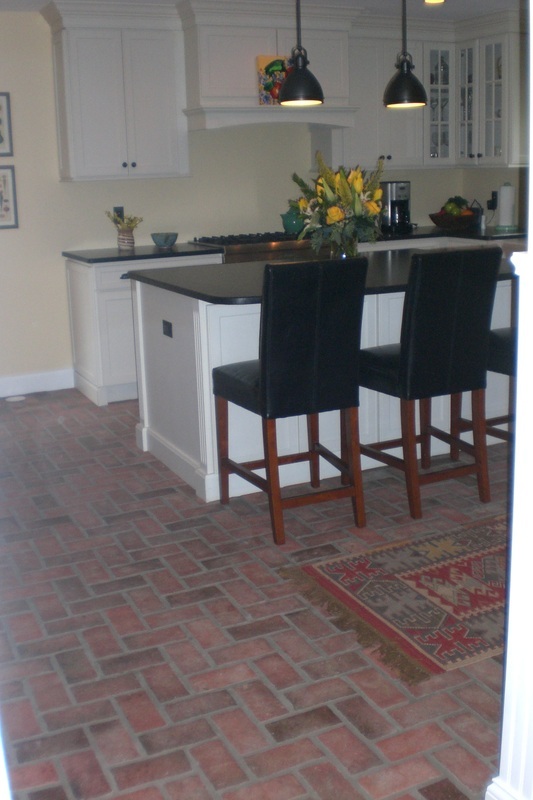 When they came through the front door, the first thing they saw was our own Wimer's Mill brick entry floor, and that is what they chose for their own new kitchen floor. 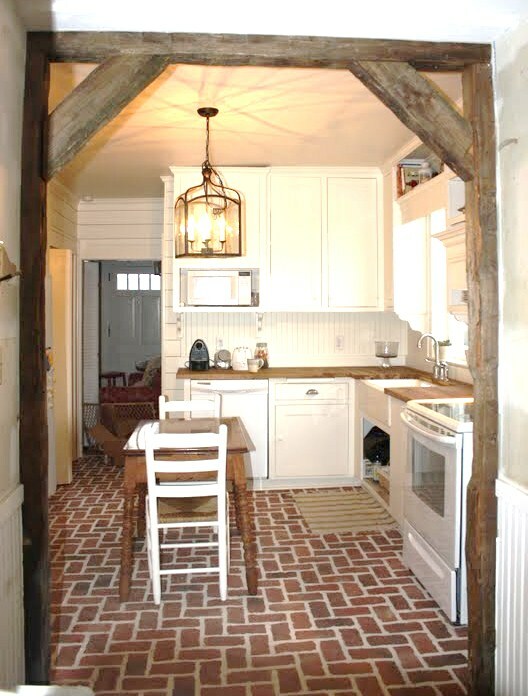 Wimer's Mill is very rustic, and goes well with the timber "bones" of the room and the wood counters. 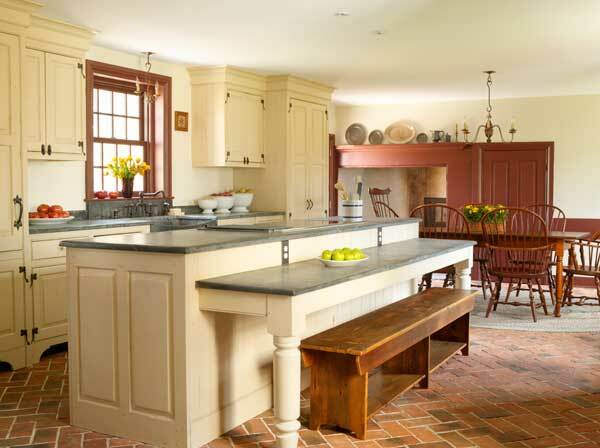 The clean lines of the painted white cabinets provides a contemporary contrast to the rest of the natural tones. 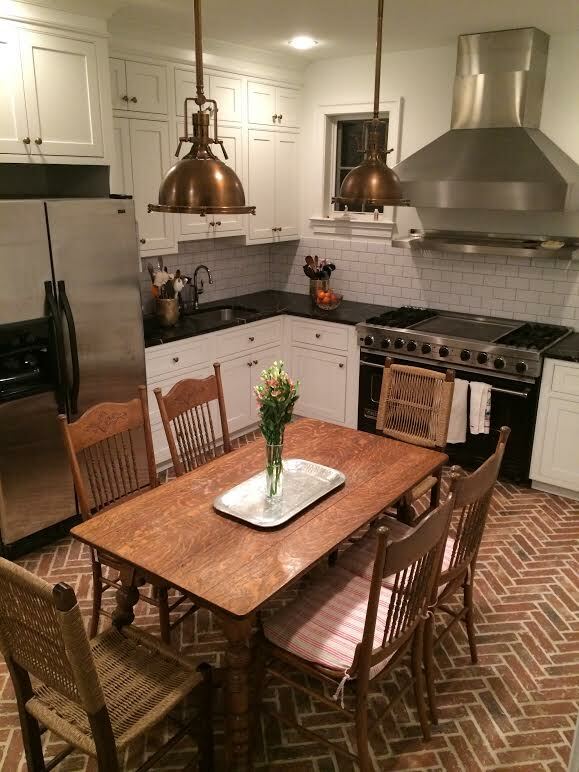 Chris Miller used our Wright's Ferry brick tiles, installed in a herringbone pattern (Providence color mix). The colors of the bricks and soft yellow walls warm up the contrasting blacks and whites of the counters and cabinets. Chris sent us quite a few beautiful pictures of her new kitchen, entry and hall, and they are among my very favorites. Thank you to Josh Boltinhouse for the pictures above. This kitchen floor will always look wonderful and hold up to the traffic of their busy family! Click images to see a larger view. Pam Scott used our brick tiles in several parts of her lake home vacation rental. (King Street style, Providence color mix). 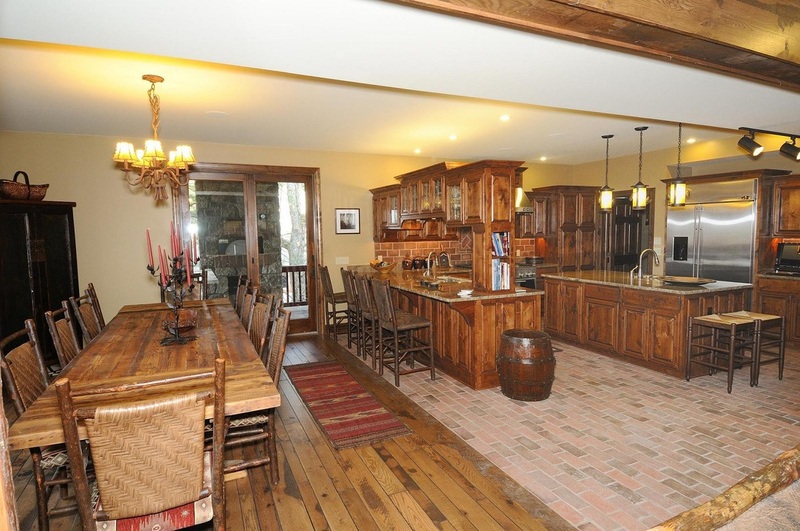 Note how the bricks mark off a separate "room" within the large open living space. Our thin brick tiles are the perfect floor for this vacation home, and will never need any care but a wash-up with a little soap and water. 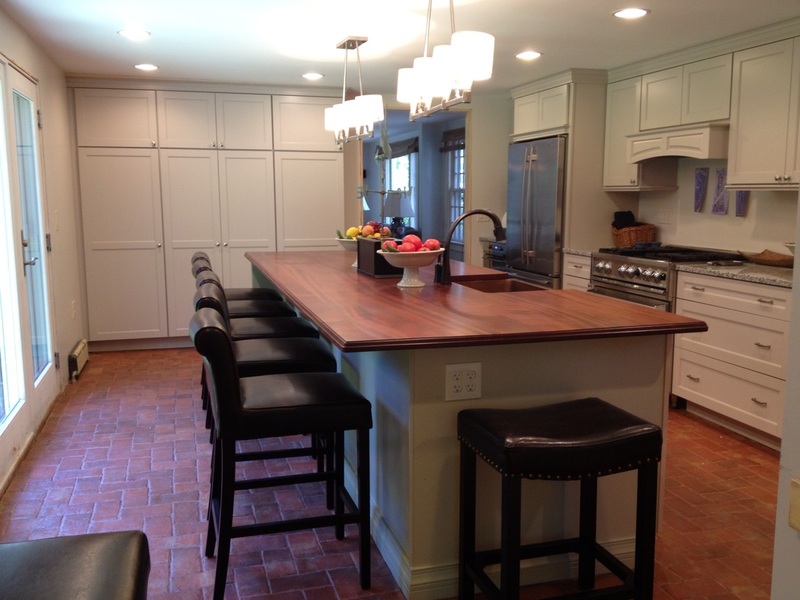 You can glimpse one of our exposed brick wall backsplashes over the stove top. Thank you to Pam for all the wonderful pictures! 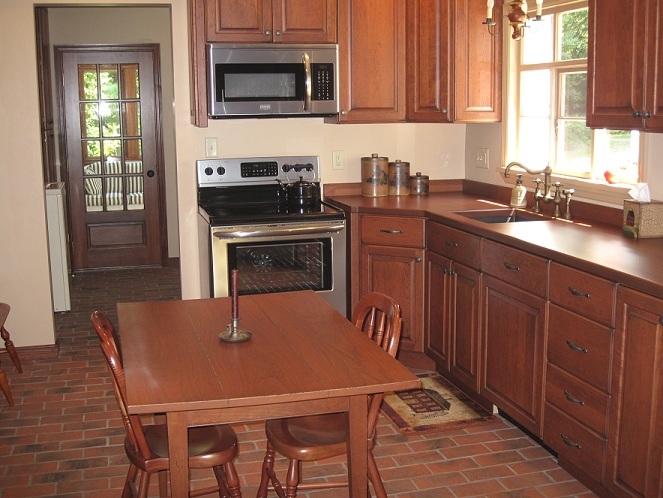 Attached are photos of our completed kitchen and laundry room remodel. 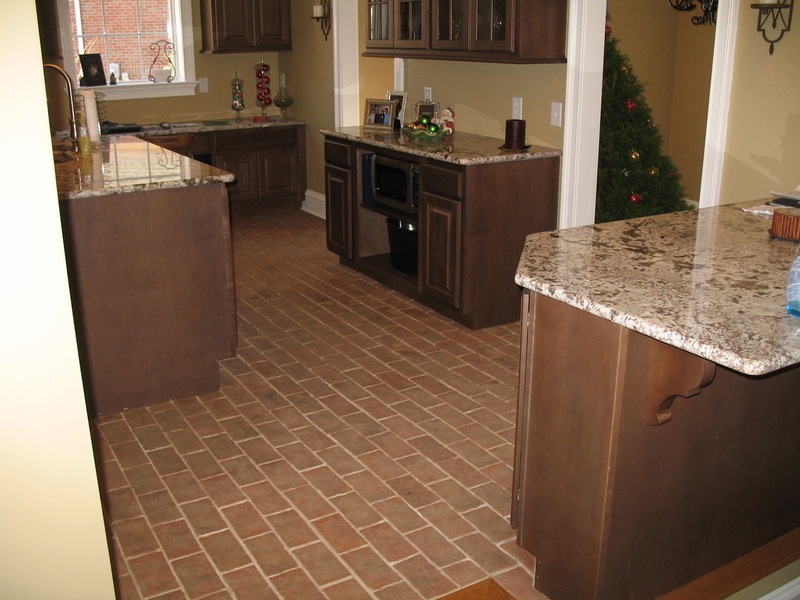 Needless to say, the brick flooring is exceptional and a highlight of the remodeled rooms. Everyone is so impressed with the flooring, and it definitely provided the "look" that we envisioned. We could not be happier with it and the ease of maintenance provided by using the Aqua Mix Enrich 'N' seal. Thank you for all your help, advice and time. Enjoy these last days of summer. Our best to you and Inglenook Tile.